LOCATED IN EGYPT on the SINAI PENINSULA, Mount Sinai has a height of 8,651 ft (2,640 m) and is known locally as Gebel Musa (Mountain of Moses). This granite mountain has long been associated with the area described in the Judeo-Christian Holy Scriptures as the setting where God revealed himself to Moses in a burning bush (Mount Horeb) and later provided him with the Ten Commandments (Mount Sinai). Jewish scholars have a tradition of considering the exact location of the Mount Sinai mentioned in the Pentateuch as being unknown or hidden. Contemporary religious and historical scholarship is in contention about the exact location of this holy mountain. In the first centuries of Christianity, desert monasticism was a common expression of the search to know and serve God. Conflict with the Roman state put additional pressure on the devout to flee to remote areas. It is understood that several monks lived in the vicinity of Gebel Musa in seclusion and retreat as early as the third century. These humble hermits are given credit for first associating Gebel Musa with the Mount Sinai of scripture. In 337 C.E., the empress Helen, mother of Constantine the Great, had a church built on the traditional site of Moses’s burning bush, endorsing the location’s authenticity and establishing the long association with the Orthodox Church. This chapel became a popular pilgrimage site and a monastic community formed around it. In about 537 C.E., the Byzantium emperor Justinian had a fortresslike monastery built to ensure the protection of pilgrims and monks. It was called the Monastery of Transfiguration. The stability this brought to the community allowed the collection and creation of priceless religious and artistic treasures over the centuries. Throughout its long history, the monastery has received gifts from the popes of Rome, Christian royalty, and especially from the tzars of RUSSIA. The imperial tzars took up the Orthodox mantle of leadership after the fall of the Byzantine Empire. The monastic community is a Greek Orthodox one but has always had the blessing and support of the Russian Orthodox Church. Muhammad, the prophet of ISLAM, also saw fit to preserve the monastery, providing a written edict of protection signed with his hand print. The monastery was associated with Saint Catherine of Alexandria in the 9th century. Tradition holds that Saint Catherine was a young woman of Alexandria martyred by the Roman emperor Maximus for her Christian faith in 305 C.E. A monk of the monastery was lead by a vision to the uncorrupted body of Saint Catherine atop the highest peak nearby, Gebel Katerina. Saint Catherine was then incorporated into the history of the mountain and the monastery. 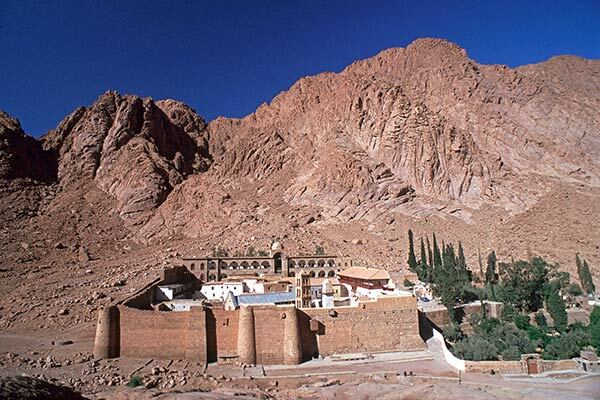 The Monastery of Saint Catherine is set below Mount Sinai and has been a focus of pilgrimage for more than 15 centuries. Within its impressive and picturesque walls are significant collections of ancient manuscripts and icons, said to be surpassed only by holdings of the Vatican in Rome. The Monastery of Saint Catherine is one of the earliest remote Christian monastic communities and certainly the oldest to have survived intact and still in use as a spiritual community. The mountain has been recognized by the United Nations as a World Heritage Site. Mount Sinai has several venerated sites on its craggy ascent. At the peak is the Chapel of the Holy Trinity, first erected in the 4th century and subsequently rebuilt more than once over the centuries. Below the summit is a plateau known as Elijah’s Basin, purported to be the place where the biblical prophet Elijah sought God’s presence. Also nearby is the spot where Aaron and the 70 elders of the tribes of Israel waited while Moses received the laws of God, the Ten Commandments. The remote location that had served to protect and preserve this unique site of world culture is now accessible by roads carrying tour buses. Mount Sinai has become an important part of Egypt’s tourist trade. The government of Egypt is undertaking efforts to preserve the ecology and cultural aspects of Mount Sinai and its surrounding area.